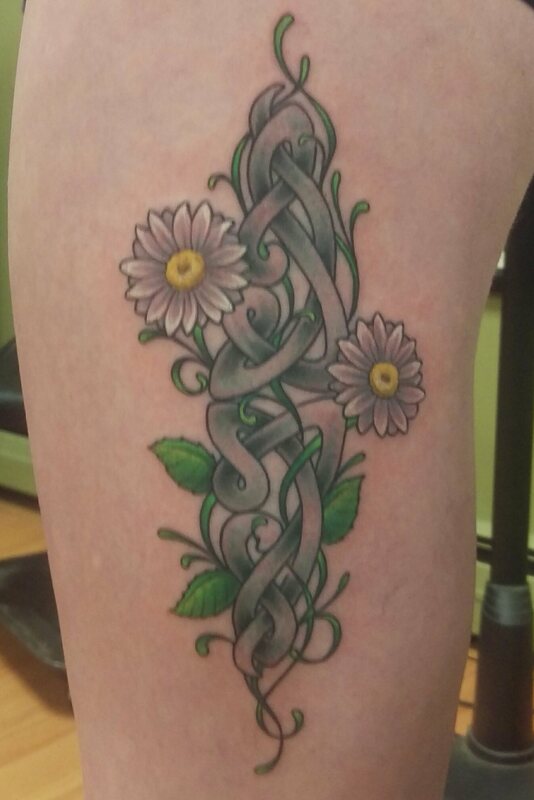 I wanted a Celtic Knot with daisies, two things I loved. Back in the late 90’s, I was taken with the idea of a Celtic Knot with “meaning” – but I couldn’t find any hard and fast information about which knot meant what. And as I thought about it, it’d be cheesy to have the Irish version of a Chinese character anyways. I figured the daisies would have stems that wove into the knot, but that didn’t do me much good since I didn’t know what knot I wanted. Where I wanted the tattoo was also a sticking point. Teenage me was looking ahead and I wanted to pick somewhere that wouldn’t sag, bag, or bulge. At first I thought it’d be on my lower back… until I found out that’s called a tramp stamp… NIX. My arm or shoulder fit the “aging well” requirements but those never felt quite right. I was reaching out, seeking to experience things which had fallen by the wayside during my marriage. My desire to get a tattoo was reignited, especially when I saw all the great art on the guys at the gym (aka my rowdy, tatted up brothers). 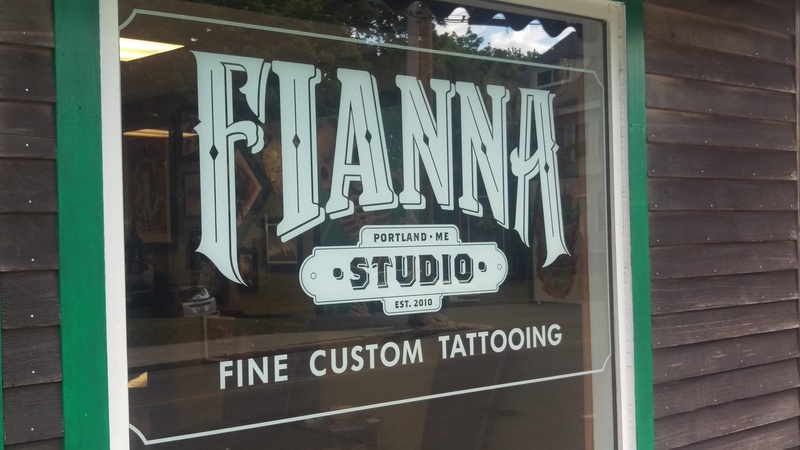 And after seeing their work, the question of what artist to use was also answered for me – James at Fianna Studios. Though a lot of the tats at the gym aren’t my style, the artistry and creativity was unmistakable. I knew where to go. The hour has arrived… well, 3 hours but who’s counting? When Dash was diagnosed with DM in November, I knew I wanted to my tattoo to include a tribute to him … but also Xena (my first Boxer) and Delta and future dogs in my life. The idea of a unique sort of tribute tattoo for my dogs had been rattling around for years but hadn’t really landed. His illness gave me a push and a “timeline” for getting it done. But what design? When I took off my wedding ring last spring, my finger felt naked and strange. I dug into my modest supply of jewelry and pulled out a ring my mother had given me from her trip to Ireland. A Celtic knot. It was one of my favorite pieces of jewelry but I’d gotten out of the habit of wearing anything besides my wedding rings. At first, I put it on my left hand… then as I adjusted to that hand “feeling” single, I moved it to my right. In a way, it became a symbol for this new phase of my life. What better knot to use than the one that means so much to me – a meaning defined by my life, not a history book. The daisies were still in place in my mind and now I knew which knot they would intertwine with. I had the idea that I could work the tribute to my dogs into the daisy stems and leaves, something that was subtle enough to be missed by an outside observer for obvious to those who knew what they were looking for. And with something subtle and small, I could add on for future dogs without a major change in the size of my tattoo. The artist gets to work. With all the design pieces coming together – knot, daisies, tribute – I made my consult appointment in January. After talking with James, the picture in my head was even clearer. I made my ink appointment as soon as he opened his next available month – March. For those of you who know me or have kept up on this blog, you might realize that March turned out to be kind of a rough month for me. 4-8 weeks post-op on my busted leg, I wasn’t even going to have my 8 week “weight bearing” appointment until after my booked tattoo date. 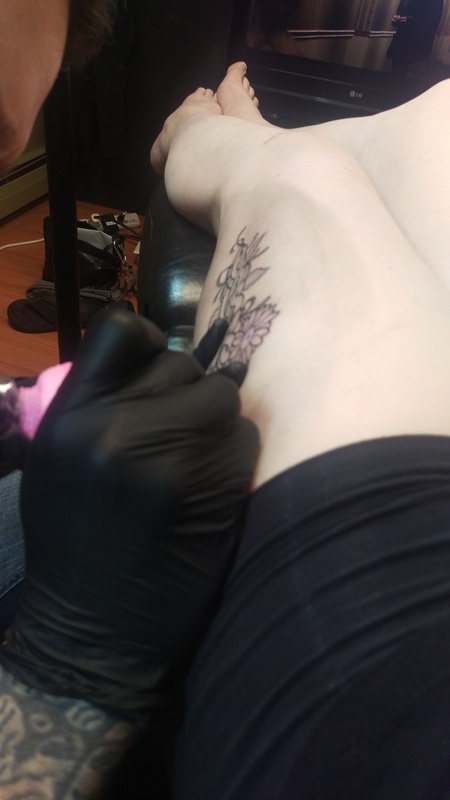 Which wasn’t necessarily a problem except… I’d decided that my tattoo was going to be on my left thigh. Which, at that time, was 4.5″ smaller than my right thigh. I tried to reason it out with my PT, arguing that the spot I was thinking of wouldn’t change *that* much, but she convinced me to wait. With what I feel right now and how hard she had to massage my leg back then to get the muscles to loosen up… good call, Kristen. A few weeks ago, I still had some questions and reservations about this whole thing. But once again, everything fell into place just when I needed it. I was hemming and hawing over the color scheme when a coworker pointed out the subtle details I wanted might be lost if I went too bold. After a friend questioned whether I really wanted a tattoo last week, I started having a little freak out. When I expressed my concern to Jen, one of my two best friends (who also has half sleeves), she started asking me questions – Why did I want it? Why did I want that design? Why did I want it in that spot? I knew exactly how to answer each question and it soothed my nerves. Finally, James and I hadn’t worked out how to incorporate the dogs – I knew I wanted their initials but wasn’t sure what would work best. Because it was a discussion best had in person, it was left until today – a fact that made me a little nervous, even though I knew face-to-face was more effective than emails back and forth. But I didn’t need to be nervous. Within minutes of walking into the studio, we’d found three places where one minor change would turn a tendril into an initial. Finally it was time to drop my pants and get my stencil. He lined it up and transferred it on. Then I looked down at it and checked it in the mirror for a few minutes. It looked different than I expected. Smaller. More delicate. 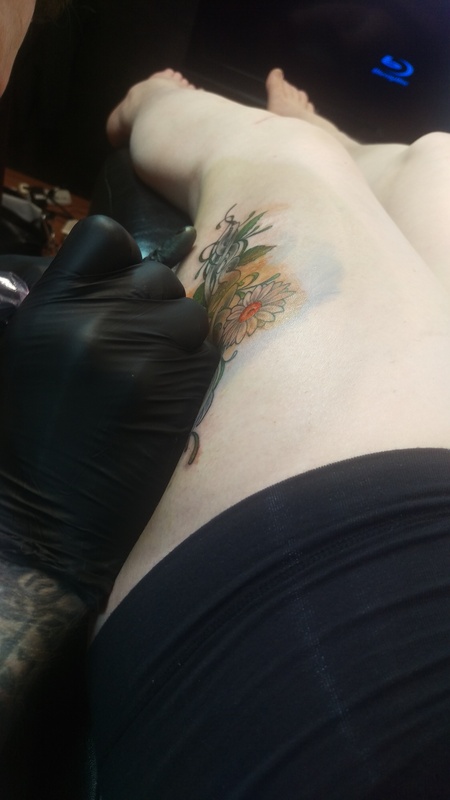 Worry had made it loom large, thinking that 9″x4″ was going to look huge on my thigh. But it didn’t. It looked right. Proportionate. Pretty. I loaded into the chair, we loaded up one of James’s many movies and away we went. I’d been warned that getting the entire tat over my IT Band would be annoying – not surprising considering that even the healthiest IT Band hurts to beat on – and he wasn’t wrong. It was like getting stung. A lot. And getting stings on top of stings. For 3 hours. By the end, I’d abandoned any pretense of watching the movie and was attempting to keep up a conversation with Jen about work, her wedding, apartment hunting… and anything else we could think of. I needed to focus on something other than the welt growing on my leg. Have you ever ordered a new dish at a restaurant, imagining it tastes one way, only to have it arrive and completely disappoint you? That used to happen to me a lot. Food, new styles of clothes, lots of things. In my head it’d be so good, so tasty, so perfect… in reality, not what I was going for at all. The funny thing is that it doesn’t seem to happen much (at all?) any more. I don’t know if it’s a change in my perspective or a change in luck. Either way, when things aren’t what I expect these days, they aren’t a disappointment. They are even better than I imagined. My knot, daisies, and dogs… can you spot Xena, Dash, and Delta? Daisies have always been my favorite flower. Simple, natural, beautiful. As a teenager, I made wonderful Daisy crowns for myself and my friends. Those crowns were inspired by a picture of Lelana, one of two dogs my parents had when I was born, wearing a daisy crown while sitting in a lush green field. The knot, as mentioned before, is from the ring Mom bought me in Ireland. I’ve always had an affinity for my Irish heritage. When it’s flipped vertically, as it is in my tattoo, the knot looks like two hearts mirroring each other. The tattoo is on my left thigh because I am left-dominant in all things (hand, eye, leg, brain). The side of my left thigh is where my dogs line up when they are in heel position. So there it is… beauty, family, love, life, and dogs. I spent the last 18 years worrying about having a tattoo with meaning. Now I have a tattoo with more meaning that I planned on, because the meanings kept revealing themselves long after I’d made up my mind about the content.